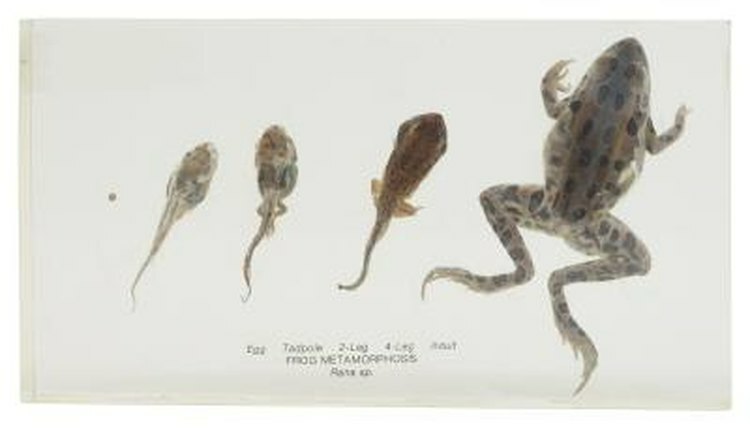 While the sequence of growth and life cycle can vary slightly among frog species, for the most part nearly all frogs go from spawn to tadpole to froglet to frog. Throughout its sequence of growth, a frog goes through a metamorphosis that transforms it from a strictly aquatic creature to one that can, and does, spend significant amounts of time on land. The Greek name "amphibian" means "double life" and refers to this transformation. The frog's life cycle begins with spawning. When mating, the female frog releases her eggs into the water and the male frog releases his sperm. The spawning mass the couple produces will contain thousands of fertilized eggs. A sticky substance attaches the spawn to nearby plants, where the mass will anchor while the eggs incubate. In most species the eggs will hatch into tadpoles within two to three weeks of fertilization. When the tadpole first emerges from the egg, most species attach to nearby vegetation and stay there for about a week. The tadpole at this point is nothing more than gills, mouth and tail. After seven to 10 days the tadpole gets more adventurous and starts swimming and eating algae. This is what his life will consist of for the next one to two months. In most species the tadpole starts to grow into a frog after a couple of months. At this stage in the transformation he is referred to as froglet. The process begins when the tadpole develops two little bumps on his tail. His tail will begin to disappear as his back legs grow and he will begin to use his new legs for swimming. His diet will change. No longer limited to just algae, he will now skim the top of the water for plants and dead insects. When his tail is little more than a stub, the froglet is ready for dry land. At about three months after spawning, in most species, the froglet walks on dry land for the first time. After about four months the final stub of the tail will disappear and the froglet will be a frog. In the spring he will return to the water to mate and start the cycle anew. The sequence of growth is very similar across all species of frogs and toads, though the times can vary considerably: some species take up to two years to complete the process from spawn to adult.